Tome Tender: Margaret McGaffey Fisk's SECRETS Spotlight & Giveaway! 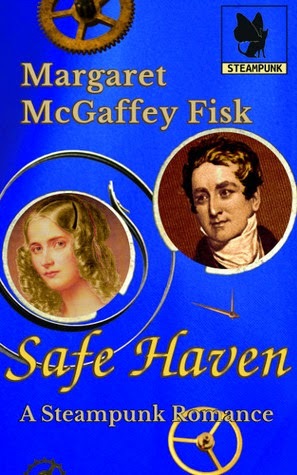 Margaret McGaffey Fisk's SECRETS Spotlight & Giveaway! 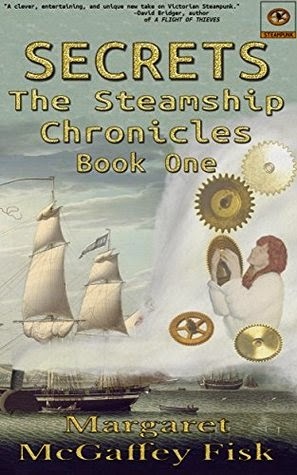 An Alternate History Victorian Steampunk Adventure for readers of all ages. Samantha Crill can read the hearts of mechanical devices and transform them into what they long to be. In a steam-powered Victorian England where only the wealthy can afford such sophisticated contraptions, the law does not look kindly on Naturals who destroy these purchases. Barely able to resist the demand of the devices, Sam becomes a danger to everyone around her, not in the least because the mechanicals show little restraint once changed. Nathaniel Bowden, cabin boy on the oldest of the East India Trading Company’s steamships, intends to learn everything he can in the hope of becoming a captain in this age of productivity. He’s eager and willing, but his despised noble background and the engineer’s unprovoked loathing threaten his position with the crew. If Sam can't learn to control her nature, the engine's whispers combined with Nat's curiosity will put his future — and both their lives — at risk. Me: Can you tell me what a Natural is? Sam: I haven't actually met a Natural before. I mean, besides myself. So a Natural is me. Me: Right. When did you become a Natural? Sam: *laughs* I've always been one. *Holds up a hand. * But if you mean when did I discover it, I don't exactly remember. It started with Papa's watch. Sam: *shrugs* It started talking to me. Not in words so much as feelings. It would hang there from the watch chain, and swing back and forth, but sometimes it would twist and turn as though trying to get away. Papa let me play with it as long as I was gentle, and the chain always held it attached to his waistcoat. It so wanted to come with me. Me: What is it about watches then? Sam: They're magnets for aether. They already move by themselves, at least once the watch is wound or pendulum set as all clocks are like this. And they control time. Well, not control it, but count it out. People are checking, and worrying, and hoping ... it just leaks onto them. Me: How do you feel about this age of steam? You were all set for the privileged life, and now you're a lowly cabin boy. Nat: Can you imagine me all up in a suit and cravat talking about law and politics? The only concern I had was my parents sending me to some desk with ink stains on my cuffs. Me: So the sailor's life is the one you would have chosen for yourself? Nat: I did choose it. My parents were willing to let me decide, though whether they would have agreed if not for Professor Paderwatch, I don't know. Nat: *shrugs* He's not one anymore with the new laws against higher learning because it isn't practical. Made him a Captain instead, not that he knows anything about steamships. Me, I know more just 'cause I get the other men to teach me. Me: And how do you get along with the crew? Are many like you, raised to wealth? Nat: Them, no. Everyone is lower class except me and the professor. It's hard sometimes. They think I'm putting on airs when I do things the way I was brought up, but I'll win them over. The first mate says I have promise -- now at least. He didn't take kindly to my plans of being a captain someday at first. Of course, I'd barely gotten my sea legs by then. Me: Sounds like everything's going well for you then. Nat: As long as nothing goes wrong. 1. Tell us about Margaret the person, who is she, what does she like, etc. I am best described by the metaphor of my current residence, something I didn't realize until you asked. I live in a suburban, gated community where the state of my lawn is investigated frequently. I live here because my backyard borders on a wilderness area that grew out of an attempt to provide proper drainage for the suburban sprawl. Hawks grab mice and rabbits for a quick snack in the back while the patrols circle the front looking for things that would bring down the house value. This very contradiction between manicured and wild matches me all too well. I'm a techie who loves computers, but I'm also the person who longs to wander in the forest and commune with the trees. Like our house, I masquerade as civilized when my heart is wild. 2. You write Steampunk, Fantasy, Romance and even Science Fiction, which is your favorite genre and why? Ouch. That's a hard question on one hand, but on the other, it's not hard at all. The answer to my favorite is wherever the story I'm currently working on is set. Genre speaks to the atmosphere and setting around the story. I write my stories where the characters tell me they are, and each of the settings offer something unique. Daphne's story of nobility, expectations, and responsibility would be ridiculous in modern times while Trina's dreams of space could be nothing but dreams if set in the Regency. For Sam to stay hidden with the very air triggering a bout as Wi-Fi signals abound would be impossible. To quote an old musical, Finian's Rainbow, I "love the one I'm with." At the moment, that's science fiction because I'm writing the Shafter sequel, but give me a month and I'll be working on a steampunk novel. 3. Do you use "real" people as your models for your characters? The short answer is not often. I've taken classes where you're supposed to use actors as models for your characters, and I've on occasion snagged a picture that matched, but generally, my characters come to me with a look and a personality already. I'd be a fool to try to force them into someone else's form or mindset. 4. Tell us THREE things about you that aren't widely known. 1) I tend to rescue cats, and when I do, I give them temporary names while I find them a home. However, two of the names have stuck: Meep and CB. 2) The first time I rode a bike with handle brakes rather than back-pedal brakes, I ended up lost in Athens and it took all day to get back. If the cops weren't called, Mom was close. 3) One of my early "books" was a fan fiction for Mr. Strong when I was somewhere around seven. My spelling and punctuation then are enough to make me shudder. Margaret McGaffey Fisk is a storyteller whose tales often cross genres and worlds to bring the events and characters to life. She currently writes romance, science fiction, and fantasy but will go wherever the story takes her. A daughter of diplomats, her early years were filled with many cultures, both very much alive and long turned to dust, and people who both pondered the great thoughts and were grand pranksters. Whether from wild adventures into the desert to climb sand mountains, poking around little known archeological sites, or visiting bazaars and inner cities, she came out of that time with a love of culture and an all too sharp awareness of culture clash. She lives in a Nevada desertscape with her husband, and a rotating collection of cats and sons. When not exercising her creative muscles, she has been known to tame the relatives of beasts in the wild--feral cats. In a different time, you'd find her before a bonfire or with a mug of ale and a lute spinning tales for all who are in earshot. Now, though, you can read her explorations of loyalty, love, and conflict wherever you might be. I love the author's bio and the kitty name....Meep. How original. Thanks, guys for the grins. Thanks, Sherry. Meep got his name because I thought he was a night bird irritating out cats with his call...until I went outside to chase it off.